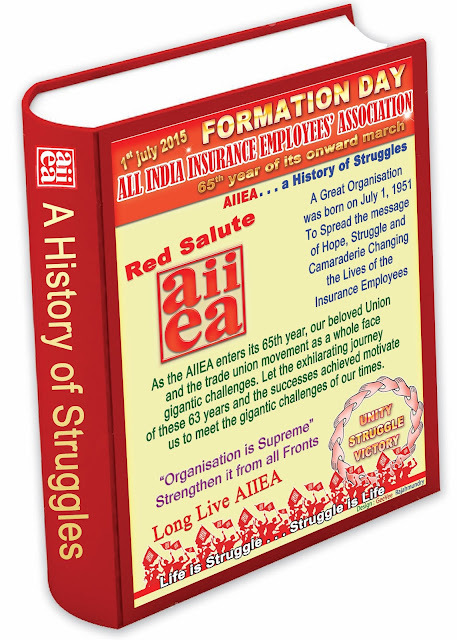 We extend our warm greetings to all the employees on the joyous occasion of formation day of our beloved organization AIIEA. 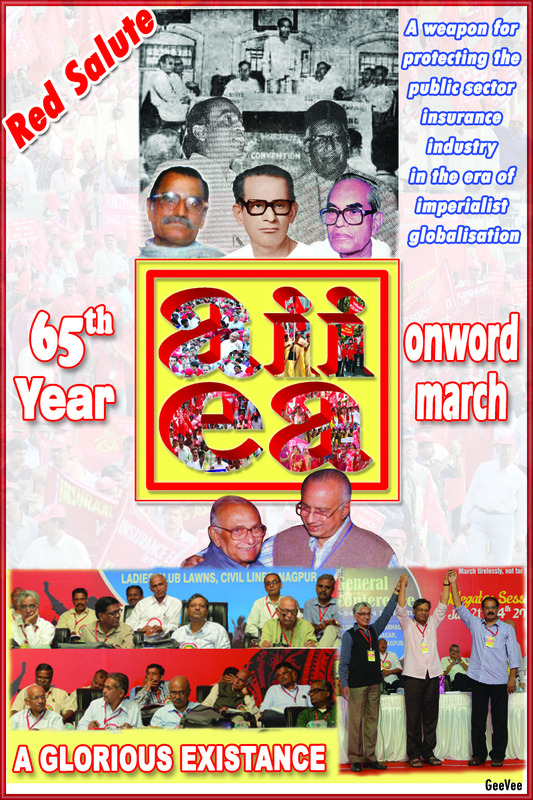 On 1st July 2015, AIIEA will be completing its 64 years of purposeful and glorious existence and will be entering its 65th year. 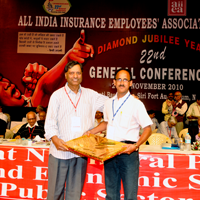 Its a matter of great pride and satisfaction that through its principled stand on the issues pertaining to the industry, in defending the economic sovereignty of our country as well as clinching a dignified life for the insurance employees through struggles, AIIEA has earned a place of pride in the comity of trade unions not only in India but across the globe. Since its formation in the year 1951 to date, AIIEA has been in the forefront in unleashing struggles against the anti- people policies of the ruling classes. All along it has embraced the ideology of the working class and firmly advocated the policy of self-reliant economic development of our nation. It was preciously this understanding with which AIIEA demanded nationalization of insurance industry so that the savings mobilized from the people are utilized for the development of nation instead of development of few capitalists in our country. The glorious struggles launched by AIIEA from 1951 to 1956 forced the Indian Government led by Pandit Jawaharlal Nehru to take an important step of nationalizing the life insurance industry in 1956 and subsequently the general insurance business in 1972. The spectacular contribution of public sector insurance industry for the development of our country during the last 59 years bears testimony to this. The history of AIIEA is punctuated with saga of struggles, sacrifice and success. It is not a hollow slogan when we tell proudly VICTORY TO VICTORY IS AIIEAs HISTORY. 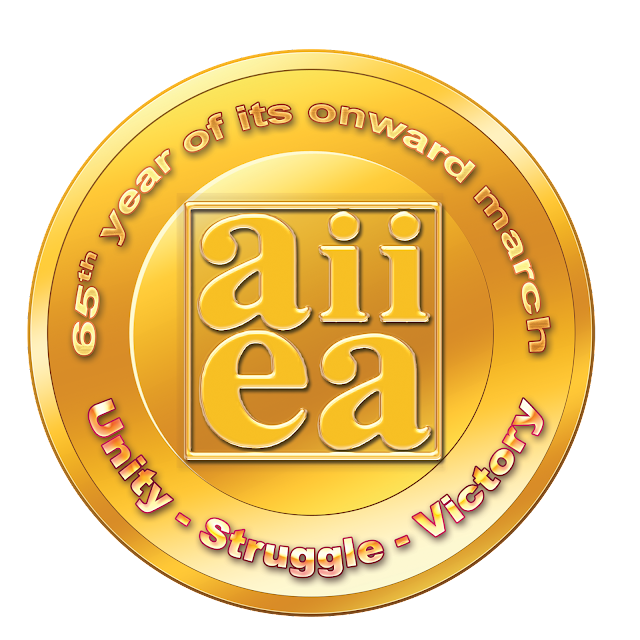 During the last 64 years, AIIEA has weathered many a storms and confronted the challenges of times and come out victorious on all occasions. Be it the struggles to improve the service conditions of the employees or for that matter to protect the interests of the public sector Insurance industry and of the nation, AIIEA has always been in the forefront to wage relentless struggles and accomplish its tasks. This was possible due to the unflinching commitment of overwhelming majority of employees in the public sector insurance to the ideology of AIIEA as well as the success of AIIEA in unifying the employees under its banner. 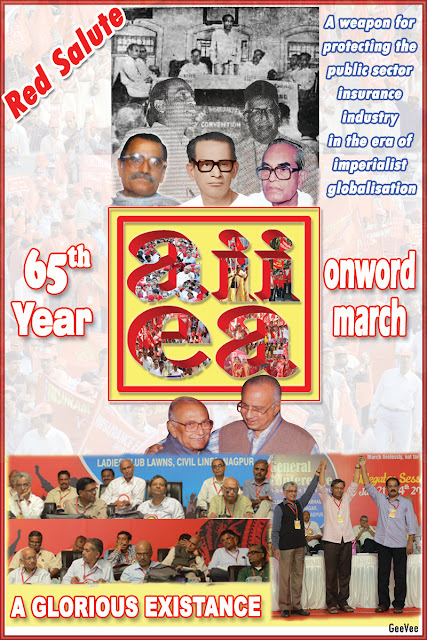 The sustained campaign and struggle unleashed by AIIEA during the last 25 years against the neo liberal policies and the attempts of pen pushers of liberalization to privatize the public sector insurance Industry is unparalleled in the chequered history of AIIEA and admired by the working class across the globe. Our struggle has not only defeated the attempts of various governments to privatize the public sector but also has contributed to public sector LIC/GIC emerging as jewel in the crown of India. 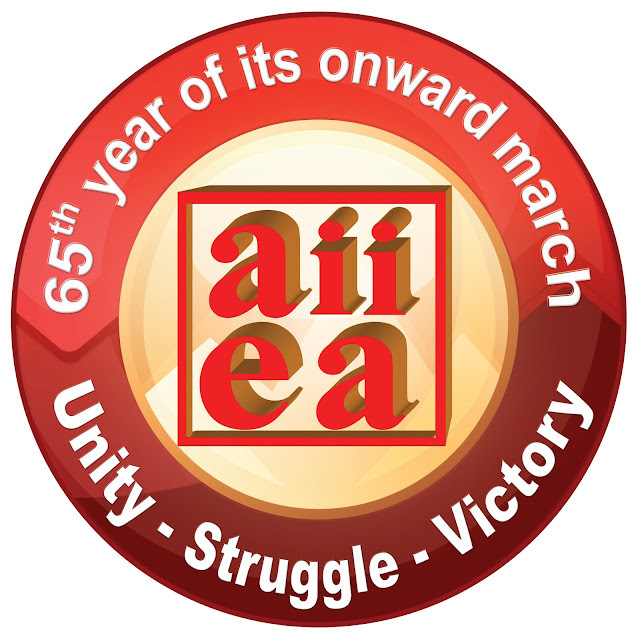 Today, when we celebrate the 65th formation day of AIIEA, we are confronted with many a challenges. We have a right reactionary government at the center led by an authoritarian leader pursuing the neo- liberal policies with more vigor. The government is making all attempts to throw open the vital sectors of economy for the private and foreign capital which is to favour the Corporate rich at the cost of common man. The manner in which government circumvented all the established norms of parliamentary democracy to increase the FDI cap in Insurance Sector from 26% to 49% is a pointer in this direction. The authoritarian attitude of the government could also be witnessed in the manner in which they were opting for ordinance route to pursue the neo liberal economic agenda, which is a real threat to the democracy itself. The one year of Modi government has been high on rhetoric and low on delivery. Promises made to people have remained as promises. All sections of people are suffering. Only the big business houses and capitalists are smiling. On the issues of good governance, corruption, black money etc., the government stands totally exposed and is not lagging behind their predecessors. The latest controversy surrounding union cabinet minister Smt. Sushma Swaraj and the Chief Minister of Rajasthan, Smt. Vasunda Raje Scindia on LALITMODIGATE scandal speaks the double standards adopted by Modi sarkar to tackle fraudsters, money launderers and corruption. Leave alone the question of bringing back black money, the country is witnessing with bewilderment how the very same perpetrators of the crime are protected by the top echelons of the BJP. Moreover, the qualification controversy surrounding the Union HRD minister Smt. Smriti Irani is becoming murkier day by day. It showcases the bankruptcy of the government in setting moral standards in public probity. In Maharashtra, the BJP is embroiled in yet another controversy involving Pankaja Munde, the Women and Social Welfare minister who has sanctioned on a single day more than 200 crores of rupees of purchases without complying with the basic procedures. The irony is that the BJP till date has not initiated any action on these erring ministers but on the other hand have openly supported them. Our Prime Minister who is ordained as the messiah of good governance by his drumbeaters is maintaining Super Mute mode on these developments which thoroughly exposes of his duplicity. Apart from pursuing pro-rich economic agenda, the Modi Government is also suppressing the voice of dissent and conscious efforts are being made to liberalize the labour laws to help the corporates. Moreover, attempts are being made by religious fundamentalists to destabilize the social fabric of our country, overtly and covertly. In the name of religion the cultural ethos of our country are attacked and the recent developments have created a situation where in the minority communities in our country are feeling insecure. We need to ensure that the unity of the people is protected and the secular fabric of country remains intact. As conscious members of a progressive trade union, we need to play our due role in preserving the unity of our country. The books of accounts for LIC for the year 2014-15 are finalized and the performance is very impressive. The Total Premium Income increased marginally to Rs. 239667 crores. The Total Income of the Corporation increased to Rs.407546 crores from Rs. 380042 crores recorded in the previous year. The Corporation generated a surplus of Rs. 37960 crore of which Rs.1803 crore is the share of the government as dividend, up from Rs. 1634 crores paid last year. Thus the rate of return on the capital employed is a whopping 1803 percent. The total assets of LIC are estimated to be Rs.19.92 lakh crore. It is important to note that both the total expenses of the management and the expenses on salaries and employee benefits showed a decline in relation to the total premium income. There is significant improvement in the conservation ratio too. The only area of concern is the decline in the number of policies and this has to be addressed in the current financial year. The LIC retained the market dominance with a 70 percent share in premium income and 75 percent share in the number of policies. This financial performance combined with the claim settlement record and increasing servicing standards makes it a very impressive performance. As insurance employees we are also in the midst of struggle to realize a meaningful wage revision without any conditionality and to secure one more option for 1995 Pension Scheme. The wage revision which fell due for insurance employees from 1st August 2012 brooks no delay. It is unfortunate that in spite of sterling performance by the public sector insurance industry in a gloomy economic situation, the LIC management and the Government is yet to give solution to the genuine aspirations and demands of the insurance employees. The stoic silence on the part of management has forced the unions in LIC to join hands together and give a call for ONE DAY strike on 8th July 2015. We need to take the necessary steps to make this strike action a historic one in order to clinch wage revision without any conditionality. The demand for one more option for pension also needs to be clinched early through united struggles. The passage of Insurance Laws (Amendment) Bill 2015 has paved the way for entry of 49% of foreign capital in insurance industry. This will pose more challenges to the public sector insurance. With more foreign capital employed, the private players will make efforts to challenge the market share of LIC albeit with tacit support from the ruling classes. The International Finance Capital is bound to mount pressure on the Indian ruling classes to even privatize LIC which needs to be thwarted. Insurance employees must be on the vigil and oppose any such move. The neo-liberal economic policies which the present dispensation is aggressively implementing can be defeated only through powerful united struggles by the Indian working class. In this background, the decision of the working class to observe a day nationwide strike on 2nd September 2015 assumes greater significance. 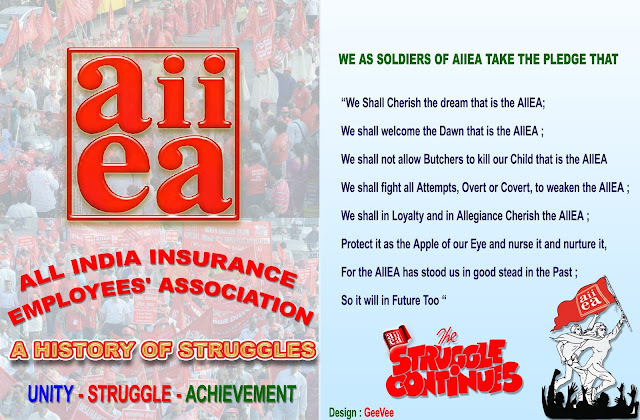 AIIEA is also a party to this unity and we need to make the one day strike on 2nd September a resounding success. In fine, when we observe the formation day of AIIEA, let us pledge to uphold the lofty ideals of AIIEA. Let us carry forward with conviction the traditions and legacy of AIIEA to achieve our objectives. Let us make our organisation ideologically strong, develop cadres and leaders and make it strong, Live and Vibrant in order to meet the onerous challenges of times. We are confident all our units will observe the AIIEA formation day in a purposeful manner by hoisting the flag of AIIEA at all centers and taking a pledge. We once again extend our revolutionary greetings to all of you on this joyous occasion.